The materials: Craft paper, cut into 4-inch squares; old magazines, wrapping paper or recycled colorful paper; decorative hole punchers (available at craft stores in various shapes, from hearts to stars); twine or ribbon; a glue stick; a Sharpie pen. The process: Punch heart or star shapes into your choice of colorful paper. Use the glue stick to glue the colorful paper hearts or stars onto the square craft paper cards. 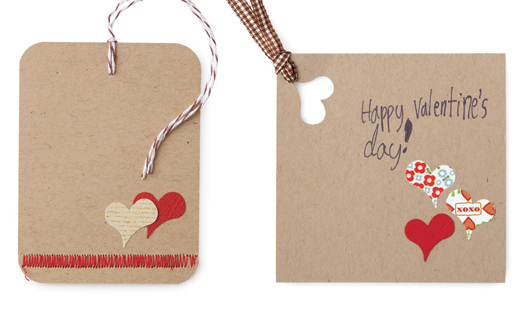 The final product: Punch a hole in the corner of card and thread ribbon or twine for a hanging tag. Use a Sharpie to write a Valentine’s Day message. stitching—Assemble is offering valentine card workshops on Feb. 5 and 12 (2–3 p.m.). You’ll create a few card samples during the class and then take supplies home to finish the rest. $20 per child.